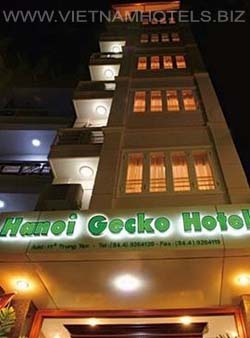 Hanoi Gecko Hotel promises unbeatable service combined with unparalleled accommodations. Designed with western guests in mind, our hotel has spared no expense in creating a luxurious atmosphere for guests who seek high quality at reasonable rates. Our rooms are the best-looking and best-equipped in the Old Quarter. With western and Vietnamese staff, we also promise that the needs of our guests will be understood quickly and taken care of efficientlly. Location: Less than two blocks from Hoan Kiem Lake, our building boasts the newest structure in the Old Quarter. Our spotless facilities allow tourists to use our hotel as a respite from the hustle and bustle of the Old Quarter, while still allowing easy access to all that this famous area has to offer. ATM on-site, and nearby are shopping centers, supermarkets, banks, post office, museums, and outdoor markets. Amenities: Our full-service hotel provides the most modern features in the Old Quarter. Installed in each and every room are the most modern air conditioners available anywhere, plus safes programmed by each guest with their own password, laptop computers with free internet, and of course comfortable beds, roomy baths, and minibars. Additionally, our hotel has an on-site restaurant, were a complimentary breakfast is served to order each morning by our accredited Vietnamese chef, specializing in western as well as Asian dishes. Services: Beyond basic services, our well-trained staff are also prepared to help with a variety of travel and tour needs. Visas, travel tickets, and tour packages are available to our guests with monthly discounts offered. Hanoi Gecko works with reputable agencies to create reliable and eco-friendly tours for its clients, striving to provide the best quality for the lowest prices in Vietnam. Extraordinary experiences from a spectacular hotel.